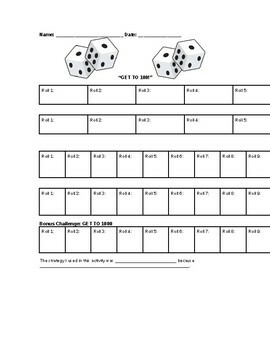 The game “Get to 100” provides students the opportunity to practice place value (ones, tens) as they add to reach 100 on the graphic organizer. Directions: Each player takes turns rolling a die. Players must decide whether they want the number rolled to be in the ones or tens place value. The game ends when the first player reaches 100. If a player rolls and totals a number greater than 100 they either skip their turn or lose.